:The media labeled Steve Reynolds "The Anti-Fat Pastor" after he lost more than 100 pounds and launched a stunningly successful weight-loss program in his church and community. In Bod 4 God, Pastor Steve reveals the four keys that have unlocked the door to health and fitness for him and for countless others who have dedicated their bodies to God! Steve had been overweight all of his life--he weighed over 100 pounds in the first grade! After playing football during high school and college, he vowed never to exercise or run laps again. That was one promise he kept, ballooning to 340 pounds and staying there for years. Now, in Bod 4 God, he shares the simple lifestyle changes--both inside and out--that led to his incredible weight loss, and he invites readers to change their lives forever by committing their bodies to God's glory! In addition, Steve shows local churches how to impact the health of their entire community, by hosting "Losing to Live" events, such as weight-loss competitions and team-driven fitness campaigns. 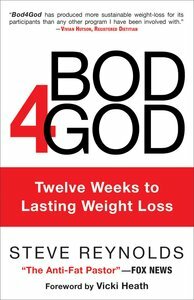 About "Bod4God: Twelve Weeks to Lasting Weight Loss"
STEVE REYNOLDS has served as the senior pastor of Capital Baptist Church in Annandale, Virginia, since 1987. He launched a weight-loss campaign in his church and community after he lost more than 100 pounds, and his story has been featured in local, national and international media, including FOX News , CNN , the Washington Post and the Chicago Tribune . Steve is a graduate of Liberty University and Liberty Baptist Theological Seminary. He and his wife, Debbie, have three children.